For people using mobility vehicles, such as a wheelchair or scooter, passing over door thresholds can be a difficult task. The installment of a door threshold home ramp is there to solve the problem and provide greater accessibility. Most doorways come with a raised threshold of heights between ½” to 4”, making it a serious impediment for someone trying to pass through it while using a wheelchair. As mobility experts, Orthopedic Service Company provides customers with a wide variety of door threshold home ramps in Raleigh, NC. Door threshold home ramps can either be secured in place for permanent use or be used as portable ramps that can be transported from place to place. 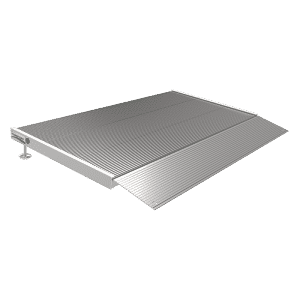 These home ramps are made of rubber, fiberglass, or aluminum and come in lengths between 6’’ to 30’’ which is the same width as average doorways, and can hold weight capacities from 600 lbs to 800 lbs depending on the manufacturer and material. Rubber door threshold home ramps can be highly slip-resistant and hold the same grip as a tire to the road. They provide easy installation and can be cut to custom fit any specific door threshold, while conforming to uneven surfaces. Aluminum door ramps are lightweight and ideal for travel and on-the-go use. These provide non-slip treads for a safer use, and holes and hardware that allows them to be securely installed to the doorway surface for a strong hold. The chosen home ramp will depend on your specific needs and requirements. At OSC, we happily guide you through our wide range of products so that you can pick the ideal door threshold home ramp for your Raleigh, NC home. Contact us today or drop by our showroom to meet one of our mobility experts and get to know all of the accessibility solutions we have in-store.